There’s a confusing array of trout flies available today. Many of them are redundant, and you don’t need that many patterns to cover most of the situations you will find in trout streams around the world. If you want to simplify your fly selection or are just starting out, here are a dozen I would not leave home without, and with this selection I’d feel confident on any trout stream I have ever fished. Don’t even think about saying “What about….” You probably have your own favorites. This is my list. It just works. It works during mayfly hatches, caddis hatches, and in smaller sizes midge hatches. People worry about using it during caddis hatches because it has tails. Yeah, and caddisflies don’t have hooks sticking out of them either but it just works. The color is mixed enough so trout seem to pick out what they want. There are tons of small olive colored mayflies in the world. 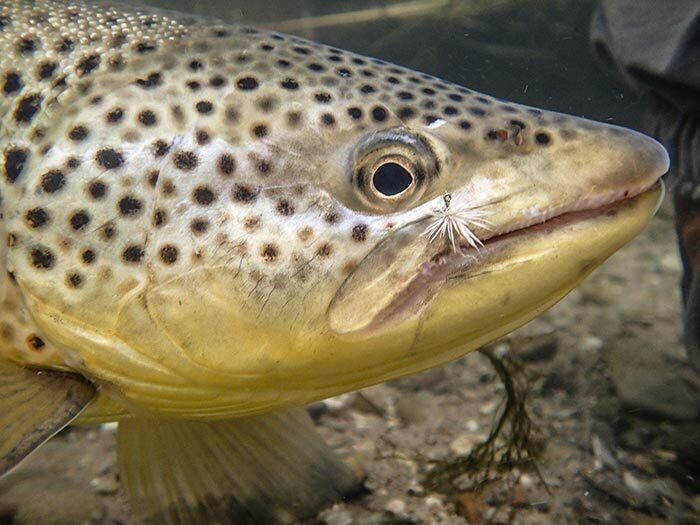 From late winter through late fall, they hatch in trout streams throughout the world. Don’t worry about what species they are—just know that you’ll see them. This imitates the stage trout prefer—an emerging mayfly with the shuck still sticking to its back end. Like Olives, cream colored mayflies range across scores of species that generally hatch late spring through late summer. The Elk Hair Caddis is a decent fly but sometimes it rides too high. Bigger trout avoid skittering caddis, and this one works good enough for an emerging or spent caddis. Plus it still has the floating qualities and visibility of an Elk Hair Caddis. Plus I think trout eat this sometimes thinking it’s a moth. You gotta have a foam fly. Pick one. This one works as well as any. For big western rivers it’s a great searching fly or hopper imitation. It works when big stoneflies are out and about. You can float heavy nymphs on a dry dropper arrangement with it. In smaller sizes it even works in mountain brook trout streams. You will be surprised the places these big ugly foam flies work. It imitates a small beetle or other terrestrial. It works during midge hatches. It works during small caddis or mayfly hatches. If fish are sipping something invisible just put one of these on. You’ll catch trout. It works during hatches, before hatches, and when there are no hatches. Don’t leave home without some. I like mine both with and without beads but find trout accept it better in heavily fished waters sans the bead. Trout probably think it’s a mayfly nymph, caddis larva, caddis pupa, scud, or stonefly. All I know is that they eat it most days if they’ll eat any nymph at all. Some kind of rubber-legged stone is essential on most rivers. It also imitates large mayfly nymphs, baby crayfish, and hellgrammites. In some rivers, you need to go tiny with your nymphs—especially in tailwaters. Although this one officially imitates a midge larva or pupa, it works when trout eat small mayfly nymphs and caddis pupae as well. I don’t think you need many streamers. When trout turn on to bigger food items they’re not picky, but at times you need a more baitfish-looking fly than the Woolly Bugger. Plus it’s good to have a light streamer and a dark streamer in your fly box. Sizes 6 and 8.